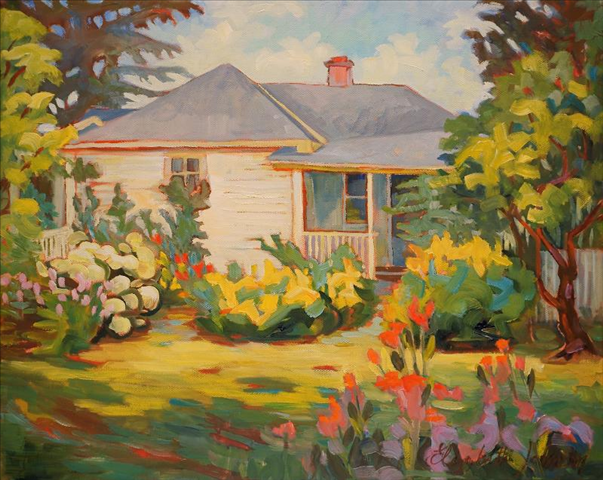 I studied art at the University of Guelph, and the Haliburton School of Fine Arts, and was mentored by Charles Reid, William Schultz, and Janette Malloy, among other North American artists. My years spent living in Paris and the island of Crete in Greece, and my travels throughout the world, have deeply formed my expansive outlook and enjoyment of life. Twenty-two years ago, my husband and I moved to Dorset, ON (Canada) to live a life of simplicity and connection to nature. It was here that we raised and educated our four children and I established my career as a painter. I paint mostly landscapes in acrylic, oil, watercolour, and pastel. My studio can be found in the charming village of Dorset on the shores of Lake of Bays. Dorset, a historically significant village, straddles the Muskoka Lake District and the Haliburton Highlands. The studio is located on Hwy #35, 300 metres south of the Dorset Bridge. Nestled behind the Wood Fired Pizzeria at Portico Timber Frames, it is surrounded by the beautiful Community Garden of Dorset. The Studio is open from mid May to early October, Monday-Saturday, 12-4pm. Friday and Weekends: By Chance OR appointment. My website is http://www.ejohnsonart.com. It has a photo gallery of my work. To pass on the favour, according to blogosphere rules, I’ve nominated you for a Sunshine Award and a Very Inspirational Blogging Award! Thanks for your thoughtful and inspiring weekly posts.